Walter Benjamin (1892–1940) was a German philosopher with controversial theories about everything from art, literature, politics, economics, and the gamut in between. He was caught up in the era of stringent Nazi doctrine with little room for divergent thinkers and was consequently persecuted. This is the gentleman and the setting that Pei-Yu Chang thought worthy subject material for a children's picture book. 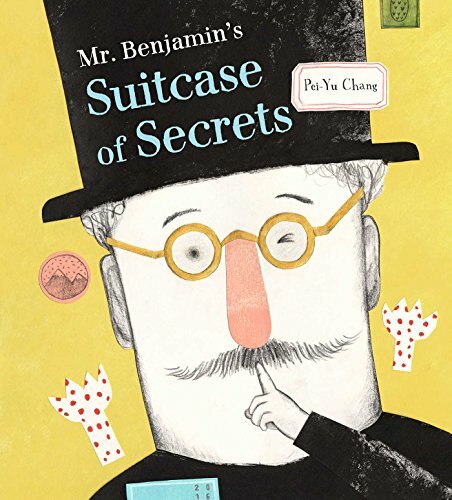 Odd topic notwithstanding, Chang forges ahead with an equally peculiar artistic style to tell a story about a suitcase. Mr. Bennie, as Walter Benjamin is affectionately known, is being pursued by the scary and intimidating Nazi regiment who is not wiling to tolerate his “extraordinary” ideas. With people being arrested, snatched, abducted, or otherwise disappearing at an alarming rate, Mr. Bennie is forced into hiding. Enter Mrs. Fittko. An Austrian escapee from a women’s Hitler prison camp, she runs a freedom trail of sorts escorting thousands of refugees across the Pyrenees to the Spanish border. She takes Mr. Bennie in with another group about to begin the treacherous trek. While everyone else travels with only the shirt on their back, Mr. Bennie is carrying a lead-heavy suitcase, which he refuses to abandon. But because he is charming, quirky, and a well respected intellectual, Mrs. Fittko allows the baggage even at the risk of holding back the other travelers in the group. The notorious suitcase contains undisclosed possessions. Mr. Bennie refuses to discuss what is inside claiming that, “the contents of this case can change everything. It’s the most important thing to me—more important than my life.” A statement of apt foreshadowing. Mr. Bennie huffs and puffs and lugs his weighty cargo up and over the mountains, reaching the border crossing. He waits his turn as the others of his party continue one-by-one triumphantly to safety. Only Mr. Bennie is mysteriously denied entry, taken to a hotel room and never heard from again. Rumors run rampant as people try to guess what he had in that sluggish suitcase. Some conjure speculations of grand philosophical importance; others presume photographic history manuscripts; or incomprehensible intellectual theories about theories. Sinister military generals claim there were weapons of untold magnitude. Lighthearted mountain folk jest about cheese, beer, sausages, and jam. And not one of them knows the truth; the mystery is unsolved. The fact that the real life Walter Benjamin knew enough about his predicament at the time to leave many of his writings in the care and protection of friends and the public library, resulting in the survival of his genius beyond WWII, the question begs to be asked: Why the heck, if that suitcase was so important, didn’t he leave it behind as well for safe keeping? Hand in hand with the alarming story line is the post-modern-esque and collage-like brutal honesty of the illustrations. The reader is given images of scribble-backed, hail-Hitler saluting soldiers; shadow figures being held up at gun-point; groupings of characters a few of which have no mouths; a stone pathway receding into a creepy forest of dark and ominous cover; and a chilling parting image of Mr. Bennie’s hat and cane resting at peace on a high backed chair, itself covered with arithmetic formulas positioned among the foothills of the behemoth mountains. The cover blurb suggests that this is a “compelling and . . . beautifully illustrated story about the importance of personal freedom and the distances we go to protect it.” While that may be true to some extent, the reality is that this is a pretty scary, intensely haunting and unsettling portrayal. The book may start with a funny picture of a goofy looking man, but it does not leave the reader with a warm fuzzy notion of how clever, free-thinking thoughts find a place in the world. In fact it conveys just the opposite. The moral is more tilted toward the message that one must be careful what one thinks, and what one cares about, because ideas are not safe and could get one into a world of hurt. Thinking is very dangerous. Moreover, even less obvious is a conclusion as to whether this really is an appropriate topic for the target reader ages four to eight. This remains to be seen. But in our country of free thoughts and free speech, it is an idea worth a shot even if it is more aligned with Grimm than with Seuss.